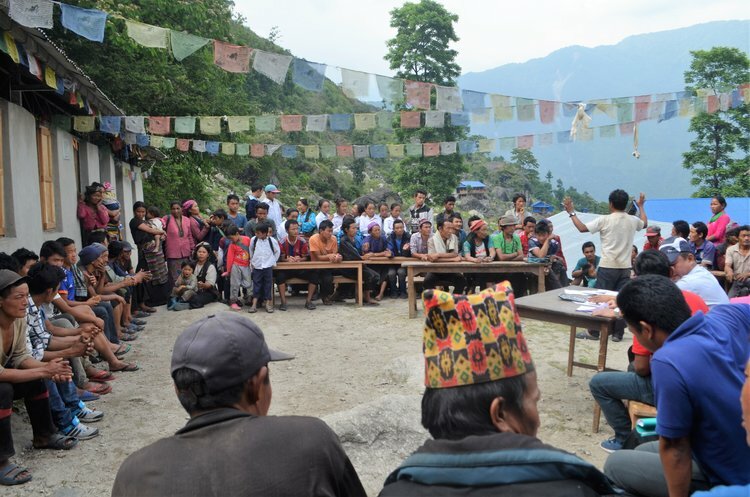 After unavoidable delays due to inclement weather and the disruption brought about by Nepal’s transition to a new government structure, we were able to complete our pilot study in Sankhuwashaba with positive results. Working with our NGO partners EcoHimal Nepal this project enables families to improve health, lower fireword consumption and reduce the time women spend collecting wood, cooking and cleaning. Through this project 30 improved cooking stoves were designed, fabricated, transported and installed into 30 homes who had agreed to participate in a pilot study. Just getting the stoves to the villages was a major achievement! Sankhuwashaba is in north-east Nepal, close to the border with Tibet. The specific project site is near the buffer zone of the Makula Barun National Park and around six days walk from district headquarter, Khandbari. Working with an engineer from stove manufacturers National Structure (Kathmandu) and the community in Sankhuwashaba, EcoHimal successfully designed and commissioned the fabrication of tailor-made stoves for the pilot phase of the project. All 30 stoves were installed into the homes involved in the pilot phase. Installation was led by the home owners after they had been trained at an EcoHimal led workshop. EcoHimal staff checked installation in every home and corrected any problems before the stoves were used. Observations, interviews and focus group discussions revealed that the improved cooking stoves burn significantly less firewood than traditional open-hearth stoves. Accurate estimates of the amount of wood saved suggests that improved cooking stoves use 66% less fuelwood than traditional stoves. Participants reported that 30 days after installation of the Improved Cooking Stoves, health problems had eased. They no longer experienced breathing difficulties while cooking and irritation to the eyes and throat had entirely ceased. They also felt that kitchen hygiene had improved, cooking pots, cloths and surfaces were soot free. Over 450 households received training on forest conservation, soil erosion, climate change, the health impacts of indoor air pollution and the environmental impacts of deforestation. Enthusiasm for the improved cooking stoves amongst the local community and local government is evident in the requests made to EcoHimal and The Glacier Trust for the supply of more stoves and more training on sustainability issues. Householders have pledged to contribute their own money towards the purchase of new stoves. EcoHimal conducted a detailed assessment of the pilot phase of the project and concluded that the project had been an overall success. A full evaluation report is now available to download. Learning’s from the pilot phase are being incorporated into the next phase of the project. The Glacier Trust and EcoHimal Nepal are currently applying to DFID UK for funding to scale up this work in 2019/20.